Why Do My Fish Hide All the Time? Aquarium fish that constantly hide among the plants and accessories within your tank isn't much fun, since the whole point of having an aquarium is to watch and admire your creatures. So it would be nice to understand what's going on here and how to correct it. The answer to the first part is rather simple: like any other animal, a fish hides because it is scared or uncomfortable with the surroundings. The more important question is what, exactly, is making the fish frightened in the first place? Here are some possibilities. If the fish was recently added to the tank, the most likely cause is that it's simply feeling nervous about its new surroundings. This is particularly true of non-schooling fish, who often like to claim a specific territory that they can become comfortable with. Given a few days, the fish should become comfortable with its new home and spend more time out and about. In the event your fish continues to hide for more than a few days to a week, there is another problem afoot. Until you correct the problem, the fish will continue to remain hidden. If fish remain hidden for more than a few days, the problem may be other ​​​fish in the tank. Sometimes the addition of a new fish will bring out aggressive tendencies in tank-mates that formerly were not bullies. Behaviorally, what is happening is that established fish that have previously staked out a territory are now feeling the need to defend their territory from the newcomer. One way to tone down aggressive behavior by established fish is to rearrange the decor in the aquarium. Once you upend the former territories, all the fish start afresh, and no one fish has the need to defend their space. Don't be surprised, however, if all the fish are a bit nervous at first and may go into hiding. But you will have cured the bully problem, and within a few days the new territory order should sort itself out. Many fish do not feel comfortable unless they have a place of their own where they can hide when they feel threatened. 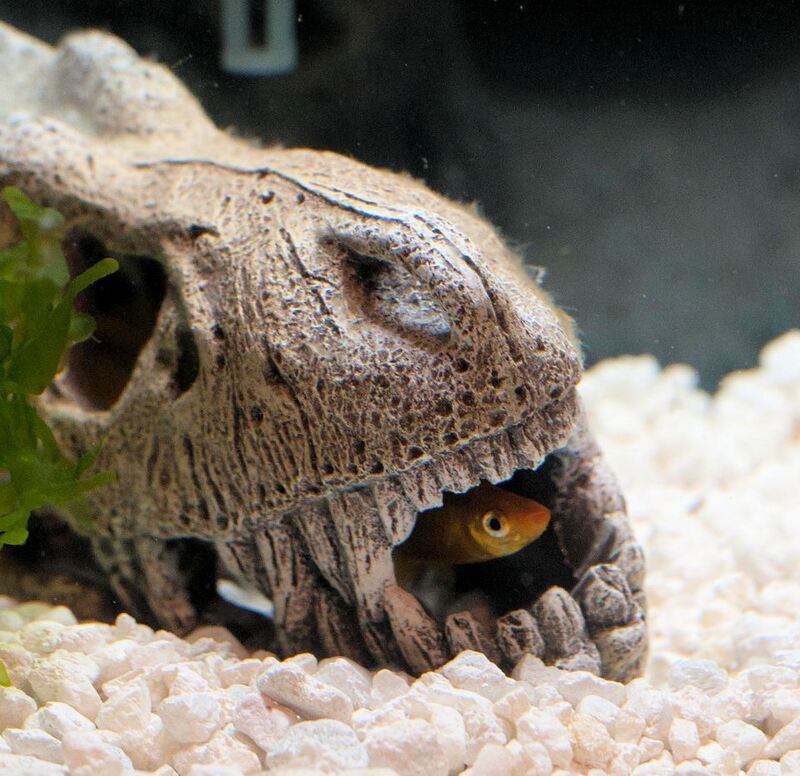 Odd as it may seem, providing more hiding places will often cause timid fish to stay out in view more of the time. You can stack rocks to form caves, place pieces of clay pots on the bottom, add pieces of driftwood with arches or holes, or use any other structures that allow fish to hide. If each fish knows it has its own personal hiding place, it will feel safe and stay out in the open more often. Fish species that normally school with others of its own kind will hide if they are kept alone in an aquarium, or if kept in a group that is too small. Always keep schooling fish in groups of at least four or five. If they are kept in smaller groups, they may stay hidden most of the time.